I had a hard time visually picking out the story in a simple chart published by the Financial Times earlier this week. There was nothing special or particularly complex about the chart—it’s a simple clustered column chart—but the fact that I couldn’t easily see the story made me think there must be a better way. 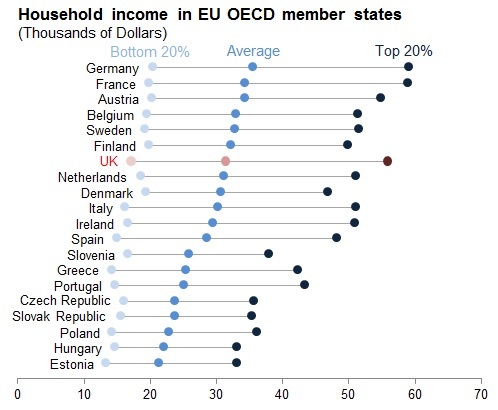 The FT article focused on how average household income in the United Kingdom is higher than in many other European countries, but that average household income in the bottom 20% of the income distribution is much lower in the UK than in the rest of Europe. The FT story mirrored the message in this report from the High Pay Centre, which used data from the Organisation for Economic Co-Operation and Development’s (OECD) Better Life Index. Notice the slight changes FT made to the High Pay Centre’s chart: they aligned the country names at a 45 degree angle instead of at 90 degrees; used a blue color scheme instead of orange and grey; reduced the number of zeros on the y-axis by converting the data to thousands of dollars; and made some other minor changes to the legend, gridlines, and title. Aesthetically speaking, I prefer the FT approach because it does a better job of reducing clutter and highlighting the data. I did, however, like the way the High Pay Centre helped focus the reader’s attention on the United Kingdom by using a different color for the country label on the x-axis. But both versions of the graphic fail to effectively visually communicate the information. 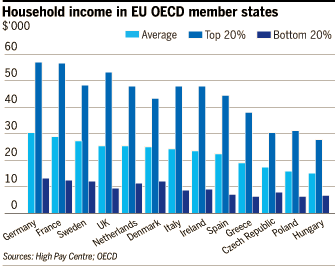 The High Pay Centre found that, with average household incomes of $53,785, the richest 20 per cent in the UK were the third richest in their bracket of all EU countries measured by the OECD, lagging behind Germany and France. However, a very different story applied to the bottom 20 per cent in the UK whose incomes were much lower than in other, more equal countries with a similar average income. 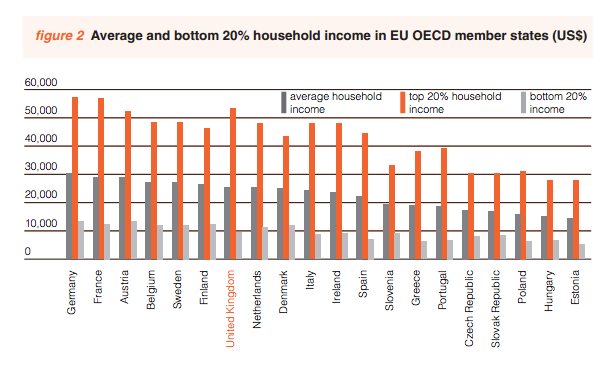 The OECD calculates the average income of the bottom fifth of UK households at just $9,530, much lower than the poorest 20% in France ($12,653), Germany ($13,381), Belgium ($12,350), the Netherlands ($11,274) and Denmark ($12,183). I found it difficult to navigate the text to FT’s graph (and the High Pay Centre’s version as well) for two main reasons. First, with 39 columns, it was a challenge to compare the different measures across the different countries. I couldn’t, for example, easily see how average incomes in the bottom 20% for the UK compared with the other countries. Second, the columns share one color palette, so values for the United Kingdom don’t stand out. Instead of a clustered column chart, I tried a different approach. In this “dot plot,” I first rotated the graph—this rotates the country labels so that they are easier to read. I then plotted each data series as dots instead of columns and linked them with a thin line. In this way, I think it’s easier to track differences in each data series across countries and to make comparisons of the different values within countries. Finally, to better highlight values for the United Kingdom—the central facet of the FT story—I used shades of red for the dots and red for the text country label. One could imagine doing even more to highlight those values, such as brighter or different colors, or maybe some annotation. I think this remake shows that even simple charts can be redesigned to more effectively communicate information. In this case, especially when a single country is of interest, highlighting those data (not just the label as in the High Pay Centre version) can be especially important. i agree w/ Morgan F about left-justifying the y-axis labels, but for a different reason. The country names right next to the data points make it easy to forget the distance between those points and $0 on the x-axis. That's important information that's getting obscured, so it's not just aesthetics. Other than that, i like your rendering very much. Thought-provoking ... thanks! I agreed with Morgan. Those 2 points came while reading the article. Please fix the chart with the suggestions. The text says the average for the UK's lowest 20 percent is $9,530. But the dot chart has the dot for the UK well to the right of the $10,000 mark. If fact, all of the light blue dots, for those countries mentioned in the text, appear to be too far to the right. Since the chart is posted as an image, that would indicate a problem with the chart itself and not with how it is being rendered in my browser. I agree with your assessment of the FT and HPC charts (though I don't like FT's choice of blues). I think your re-envisioning the charts was also well done. I would have just done 2 things differently. 1) I would have left aligned the country names. We can't see the dots on the left separately from the names and that interferes with our ability to correctly interpret them. 2) I would have overlaid two vertical reference lines with the Lower 20% dot for the UK and for the Upper 20% dot for the UK. I would use fine dotted lines in the same color as the actual dot so that they are not too obtrusive but are also intuitively linked with the dots they affiliate with. With the two reference lines we could much more easily see how the UK is way below/above other countries in those areas. Thanks for the article! People really don't pay enough attention to how they portray information sometimes these days.